Kerry defeated Limerick City by 2-14 to 0-6 in the Celtic Challenge Under 17 Hurling competition on Wednesday May 4th at the Gaelic Grounds Limerick. This entry was posted on Wednesday, May 4th, 2016 at 12:00 am and is filed under events, News. You can follow any responses to this entry through the RSS 2.0 feed. Both comments and pings are currently closed. Galway City West defeated North Clare by 3-12 to 3-11 in the first round of the Celtic Challenge Under 17 Hurling competition on Wednesday May 4th at Pearse Stadium Galway. 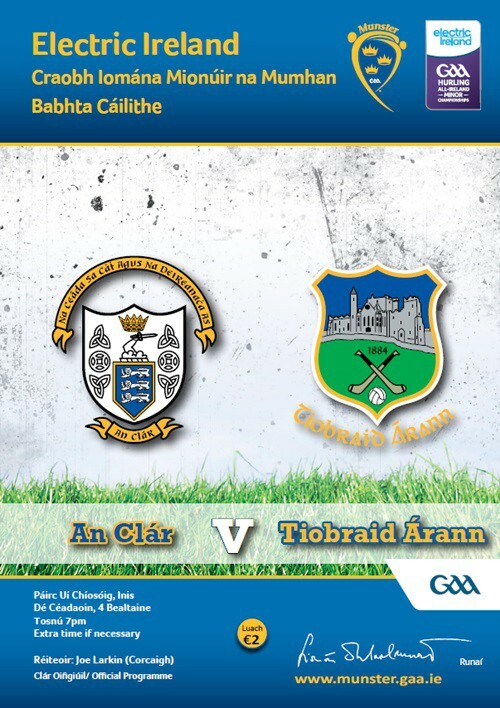 Tipperary defeated Clare by 2-15 to 0-12 in the Munster Minor Hurling Championship Play-off 2 on Wednesday May 4th at Cusack Park Ennis. TWO LATE GOALS finally catapulted Tipperary into the last four of the Munster Minor Hurling Championship in Cusack Park this evening in front of an attendance of 1,191. Despite holding a commanding seven point lead by the midway point, Tipperary certainly needed a strong finish after a resurgent Clare whittled the deficit to just three with only minutes remaining. However, after a Mark Kehoe shot was excellently saved by home goalkeeper Killian Nugent, Tipperary would make the breakthrough in the next passage of play as Kehoe seized upon a defensive error to unleash the unmarked Cian Darcy to billow the net. It seemed to lift a weight off the visitors’ shoulders as they finished with aplomb, with substitute Dylan Walsh firing to the net with his first touch to flesh out the final margin. Clare are the first team out of this year’s championship, having been sucker-punched by a late brace of goals in both their derby outings against Limerick and Tipperary. However, with ten wides over the hour, the Banner will rue missed chances against a physically superior Premier side. Level at 0-4 to 0-4 by the end of the first quarter, Tipperary upped the ante considerably until the break as they outscored their hosts by 0-8 to 0-1 including three superb Ger Browne points to power to a 0-12 to 0-5 interval advantage. Clare hit back with four points in as many minutes in the third quarter, two from Ian Murray but with Browne and Kehoe in excellent scoring form, they would restore a six point lead entering the final quarter. Captain Sean O’Loughlin, Murray and substitute Conor Lynch set up a tense climax as Clare halved the arrears by the 57th minute but a lack of physicality meant that they never looked like getting an equalising goal. Instead, it was the visitors who found the net when it mattered most to set up a semi-final meeting with Cork in Pairc Uí Rinn on Thursday, June 30th. The Tipperary team to meet Clare in the Electric Ireland Munster Minor Hurling Championship Play-Off 2 in Cusack Park, Ennis this Wednesday evening, May 4th at 7pm has been announced by manager Liam Cahill. Liam has kept faith with the same starting 15 from Tipperary’s opening round match against Waterford as he looks on his side to show their true potential and hopefully progress to the semi-final. South Kilkenny defeated Waterford City by 5-18 to 0-2 in round 1 of the Celtic Challenge Under 17 Hurling competition on Wednesday May 4th at Nowlan Park Kilkenny. Cork City defeated West Limerick by 2-21 to 0-8 in round 1 of the Celtic Challenge Under 17 Hurling competition on Wednesday May 4th at Mick Neville Park Rathkeale. South Tipperary defeated Carlow by 3-11 to 0-12 in the first round of the Celtic Challenge Under 17 Hurling competition on Wednesday May 4th at Fenagh, County Carlow. 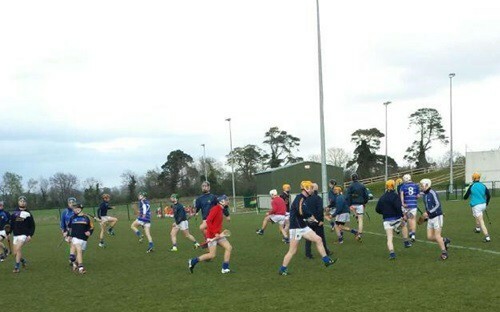 Tipperary’s representative in the inaugural Celtic Challenge Under 17 hurling competition comprises of players from the west and south divisions who collectively are called South Tipperary. Fenagh in Co. Carlow was the venue for South Tipperary’s first competitive game in this competition where they were pitted against Carlow’s county team. Carlow opened the scoring with a point from Mikey Kavanagh which was responded to by South Tipperary with points from Fergus Halligan, Andy Byrnes (2, 1 free), Conal Donovan and a goal in the 10th minute by Cathal Bourke. Two Carlow frees from John Nolan and a second Carlow point from Kavanagh narrowed the gap and despite playing against a strong breeze Carlow began to assert themselves against a South Tipperary team that was wasteful on occasion and who, apart from a point from Ross Bonner, found themselves overly reliant on scores from frees from midfielder Andy Byrnes. The half time score was 1-7 to 0-5 in South Tipperary’s favour. The second half opened with a pointed free for Carlow by Dan Sheehan which was excellently replied to by South Tipperary’s Cathal Bourke. Carlow then scored five unanswered points to level the game and with momentum building in their favour and the assistance of a strong wind Carlow seemed to be gaining the upper hand. South Tipperary dug deep however and showed a lot of resilience. Halligan and Byrnes (free) led the charge with points to put South Tipperary two ahead before substitute Niall Hoctor with his first involvement in play made a piercing run through the Carlow defence to score a crucial and well taken goal. Nolan had a point for Carlow before Donovan and Bourke scored a goal and a point respectively to conclude a strong final quarter from the South Tipperary team and to seal a victory on a score line of 3-11 to 0-12. South Tipperary’s win was built upon on a steady defence where Donnacha Quirke was commanding and dependable at full back with support from his corner backs and where the half back line of Paul O Heney, Fiachra Scott and Niall Heffernan was solid throughout. Wing back Paul O Heney’s tussle with Carlow’s John Nolan was one of the highlights of the game. Midfield put in a very workmanlike performance whereas the attack, while occasionally giving glimpses of their potential, did so in earnest in the last 15 minutes in particular. South Tipperary’s next game is at home against Waterford City on Wednesday 18th May at a venue to be confirmed. South East Clare defeated Mayo by 5-21 to 0-9 in the first round of the Celtic Challenge Under 17 Hurling competition on Wednesday May 4th at Ballinderreen.